Having seen or experienced how much of a blessing the materials in our library can be for you, have you thought that many of them have been donated or are being lent by other parishioners? You too can be a blessing for someone else by doing the same. This form will explain how you can donate or lend materials you own. To donate items to our library, simply take whatever items you wish to donate to the Library Exchange Desk any time it is open. We will later review your donated material(s) for relevance, quality and need (we will generally not catalog a material if we already have two copies of it). Those materials which meet these critera will be added to our parish's library collection. We ask that you bring only as much at one time as our librarians can carry. We do not accept cassette or VHS tapes and magazines. Any materials we decide not to add to our library catalog, will be saved for later donation another charitable organization. To donate money to our library, simply write a check payable to St. Mary Magdalene and give it to one of the Exchange Desk volunteers at your convenience. 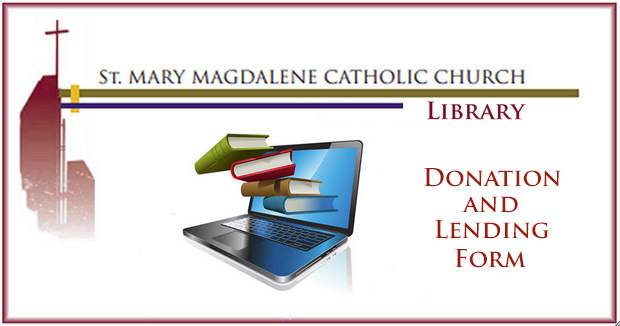 You can write "St. Mary Magdalene Catholic Church Library" on the memo line if you wish. Your contribution will be used to purchase library materials. Items you decide to lend will stay in your possesion. You will simply supply your contact information plus a small amount of information about the materials you are lending by using this form. That allows us to identify and then catalog them in a manner that fully describes it in our catalog. Materials offered to us on a lending basis will be evaluated using the same standards described above for donated materials (except condition, which is of course unknown to us). We ask that you do not lend materials not in good condition. You will be notified by email in the future when someone asks to borrow it. Use the rest of this form to lend books, DVD's and CD's. If you are offering books or educational DVD's there will probably be an ISBN number on the cover - it's all you need if it's there. If you wish to lend more than 5 items, you can quickly submit another form with your name as the only identifier. You can submit as many as you like. PLEASE NOTE: If you are lending something, the first time you bring your book, CD or DVD to the Library Exchange Desk to be borrowed by a library patron, we will affix a 2 " x 2.5" label to it. The lable will go on the inside of the front cover of books, on the inside of the case for CDs and DVDs if possible, and on the back if not. The label will identify the book, CD or DVD as being yours. It is an important control for our library system as well as a protection for you. Do you have an ISBN for item No. 1? Do you have an ISBN for item No. 2? Do you have an ISBN for item No. 3? Do you have an ISBN for item No. 4? Do you have an ISBN for item No. 5? Thank you so much for contributing to and supporting our virtual library. Your donation will help someone else grow in faith. Submit this form and return to the Library Home Page.